Unless you're an eager beaver with a spare $3,000 knocking about, you'll probably skip over the developer edition of Microsoft's HoloLens and wait for the consumer model. The good news is that when it does inevitably arrive, you'll be able to check your emails without taking off the headset. That's because Microsoft has just released a HoloLens version of its Outlook Mail and Calendar, which will also work on any other device running the Windows Holographic platform. While Microsoft has essentially lifted the same apps from the desktop and just plonked them on your face, there are some other neat things you can do with it - such as pinning your emails or calendar to a wall. That means you can move around the room and just glance over to the wall when you want an update - freeing up your screen to work on other tasks. 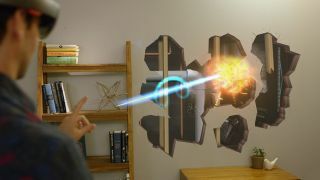 At Computex 2016 Microsoft announced it was opening Windows Holographic to third parties, who will be able to build their own augmented reality and virtual reality device on the platform.